White-tailed deer is a very adorable animal species. These deer are humble and helpless when threatened by predators. They have very few adaptive or defensive features. They are fun to play with. The need very few caring procedures and lots of love if petted. This wonderful animal is completely harmless even when they are harmed. Weight : A grown up male deer of this species, of average health, weighs between 90kg and 130kg. A grown up, average health, female deer of this species weighs between 40kg and 90kg. Eyes : Deer have two-colored vision, called dichromatic vision. They cannot see orange and red colors. Antlers : Male deer has one to six points in each of his antlers. Some females also have antlers, though very rare. Those female deer suffer from hermaphroditism. Limbs : This species of deer is a quadruped animal. Experts believe that this species used to have 5 toes. With time it evolved into 4 toes. The toes secrete a kind of waxy substance that help track down their way. Tail : Their tails are small with white colored underneath part. They are known to raise their tails and show the white part as an alarming signal when predators are somewhere near. Color : These deer stay covered with thick coat of greyish brown coat throughout the winter months. During spring and summer they are reddish brown in color. 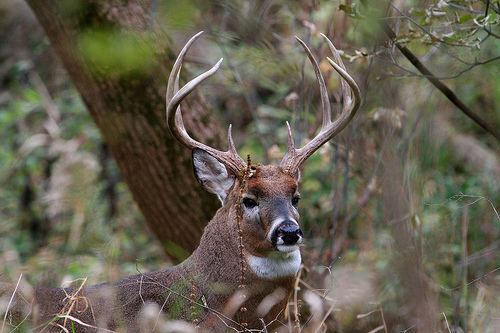 White-tailed deer have some very prominent behavioral traits. Find all about their behavior below. They have some glands that secret a typical smell which marks their range. This also works for traces of male deer that are eager to mate and are looking for female does. They raise and wave their tails as an alarm to make other deer when any sign of danger is around. The stags or bucks indulge in antler-fight amongst themselves over a single doe. These deer are herbivorous in their diet habits, like all other species of deer. They feed on lush, green grass, leaves, small plants, shoots, etc in summer and spring. During winter days they feed on twigs of plants, buds, corns, nuts, etc. when fresh green is not available. 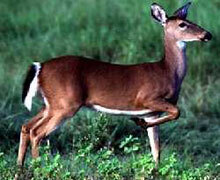 White-tailed deer are found almost all over United States and Southern Canada. This species cannot be found only in south-western parts of U.S.A., Hawaii and Alaska. This species of deer inhabit woods and forests. They tend not to live too deep inside the forests in fear of being preyed. These deer stray around in a range within 1 sq. mile. 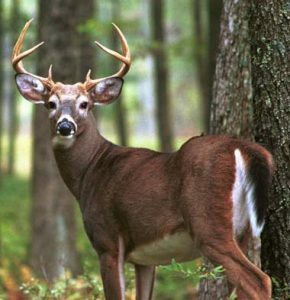 Most of the carnivorous animals of the forest prey on white-tailed deer. Tigers, lions, leopards, bob-cats, hyenas, wild dogs, wolves, mountain lions, coyotes and other big cats prey on these deer. These deer outrun their predators by running away. They are very fats runners. They can sprint to 30 miles/hour, can leap to a height of 10 ft and can cover a distance of 30 ft at a single go. This is their greatest adaptive feature. The young fawns lay down on the ground and their skin color camouflages with the ground and the wood. That is how they get overlooked by the predators. Mating season of the white-tailed deer species differ according to their distribution range. Those deer which live in the northern part of their distribution range mate during throughout November. Those deer which live in the southern parts of their distribution range mate in the months of January and February. Female white-tailed deer, called does, mature sexually by the age of 2 years approximately. They become eligible to reproduce after 6 months from their maturation. Male deer would compete amongst themselves to court and breed with a female doe. Males mate with many females during the rut. Male deer keep mating without rest or food till they get exhausted. Does or the female deer give birth to1 to 3 young ones, called fawns, during the late spring season. White-tailed deer have many sub-species. Most of them are determined on the basis of their distribution zone. Some of the subspecies are Acapulco white-tailed deer, Northern woodland white-tailed deer, Chiriqui white-tailed deer, Arizona white-tailed deer, Kansas white-tailed deer, Mexican white-tailed deer, Northern Rocky Mountains white-tailed deer, Coiba Island white-tailed deer, Bulls Island white-tailed deer, Texas white-tailed deer, and Hunting Island white-tailed deer, though there are many more. The young fawns are born reddish-brown colored and have white spots all over their bodies. They are capable of walking since birth, though feebly. 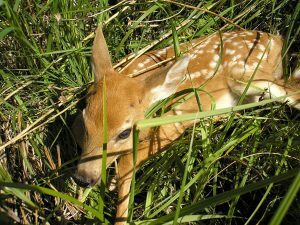 Male fawns leave the parents’ habitats after a year, whereas the female fawns stay with their mother does till 2 years of age. An average white-tailed deer lives for about 4 years to 5 ½ years in the wild. This deer species have been recorded to live for 6 years to 14 years in captivity. White-tailed deer could be an exotic pet to have and easy to take care of. Read below the easy care sheet of these deer. Housing : This deer can be kept in the backyard of the house. But take care that it does not loiter around in the neighbors’ backyards. Keep them under a shade over head to protect from direct sun. Keep them indoors in rain and snow. Food : Diet of these deer are very simple. Feed them with lush, fresh greens in sprig and summer. Give them corns, fruits, soft tree barks, etc in winters. This is their diet in the wild also. Caring : Provide them with a warm feeling and secured ambience. They must not be cuddled all the time but don’t keep them alone for long. According to IUCN assessments this species of deer is perfectly safe and comes under Least Concern list. White-tailed deer is as attractive looking as interesting to observe. Find out some very interesting facts about this deer below. They wave their tails like lags to alarm the fellow beings if any danger is sensed. They are able to jump 10 ft. high covering a distance of 30 ft. at a single go. Young male deer leave their parents after a year. The female ones stay till two years. The young ones can walk feebly since the very moment of birth. See how this astonishing species of deer looks like in the pictures below.